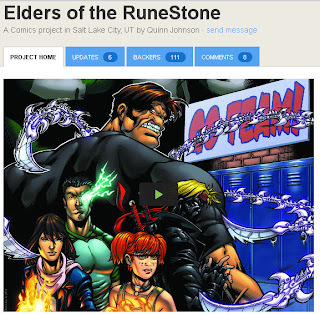 In this guest blog, Robert Atkins, Comics Experience Art Instructor and professional penciler, along with his collaborator, writer Quinn Johnson, have a conversation about their new Kickstarter project, Elders of the RuneStone. Quinn: First of all, the guys at Comics Experience are incredibly gracious and awesome to give us this opportunity to be featured on their blog. I'm sure there are a lot of comics creators who would kill for a chance like this! Quinn: The basic story of Elders of the RuneStone is about five teenagers--Scott, Jenny, Dain, Kat, and Zeniff--who all come from very different backgrounds and have their own struggles and secrets. To say they would never willingly hang out with each other is an understatement! But everything changes when they find a glowing RuneStone that gives them incredible superhuman abilities. Forced to work together to discover the mystery of what the RuneStone is and why they were given these powers, they are soon joined by the Adder, a shadowy vigilante with secrets of his own. Almost immediately they are thrust into battle with vicious adversaries, including gangsters, psychopaths and assassins, who plan to tear their city apart. These are truly evil, scary bad guys who will test these unlikely heroes to their limits, both physically and emotionally. The story is loaded with superhuman action, martial arts, high school drama, deep characters, and a good amount of horror. It's very colorful with a profound dark streak. Basically it's everything I've ever wanted in a comic book series. Am I leaving anything out? Quinn: The first idea for the story popped into my head when I was sitting in my ninth grade science class (almost 20 years ago--yikes!). I suddenly got this picture in my mind of the huge 12-foot Gar (the transformed Scott) crouching and peering though a hole busted through the wall of the high school hallway with Kat riding on his shoulders and also looking through. I wanted to find out who these characters were, and the story expanded from there. Many traits and background bits on the main characters are closely based on myself and kids I grew up with, so there's a lot of heart in the story. The series became my lifelong obsession and I kept developing it over the years. I had a breakthrough when I met Robert at the Savannah College of Art and Design about 10 years ago, saw how his art was on a whole different level than mine would ever be, and convinced him to join me on my quest to get the series fully realized and published. Besides just his awesome art, Robert is an incredibly awesome guy and we have become very close friends. He's a great example to me on so many levels! Robert: What really grabbed me from the start was the relationship of these kids. Reading the scripts and having Quinn describe how they interacted seemed so real to me and put me right back in high school dealing with those same successes and frustrations. Well and there were ninjas....honestly he had me at ninjas. Quinn: The scientific formula for "awesome" is universally "(Anything) + Ninjas." 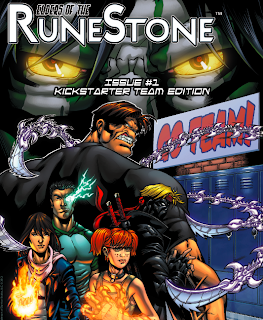 As to how our Kickstarter campaign started, Robert and I had been putting tons of work, time and money into the series for years. One of the major obstacles we kept hitting was the enormous amount of capital it would cost to get the production off the ground, especially if we wanted to retain complete ownership of the story and its characters. We struggled, discussed, and both being devoutly religious guys, prayed about it many times. Robert and I came upon Kickstarter.com and it just felt very right--suddenly the possibility of raising the necessary capital seemed like it was actually possible. Robert: For anyone looking to work together and make a comic they hope to become a long-term story, there takes a certain trust and a lot of honest communication. Quinn and I have been friends for a long time, and over the years I've seen times where it could have easily fallen apart. More often then not, you have to be willing to listen and set your pride to the side to keep things on track. I was wary about Kickstarter at first, but in recent months I've seen many projects get funded successfully. I noticed that it all centered around a solid concept and even more solid marketing. The marketing aspect is something I thrive on and get excited about. Quinn: For the Kickstarter project we're working to raise $9,000 to fund the production of the first 4-issue miniseries. With that under our belt, we'll be in a great position to secure a great publisher, and build the story from there. (I've already written 36 issues worth of storyline, so people can expect a lot of awesome story in the future once we get this first miniseries finished!) We've spent the past several months putting together a tight plan for costs, rewards to give to backers, and promotions, including the video featured on our main page to explain the project and ask for support. I think it's all really paid off as we've already gotten a huge response! It's cool to see so many people get so excited about the story and want to support it seeing the light of day...especially when some of the rewards involve having themselves inserted into the story! Robert: I found that we've built up a solid fanbase even without having a book on the shelves, and that all comes from marketing decisions we've made these last couple of years. With just a little more support, we'll have the Kickstarter funded and be able to finish production! Quinn: Yup, we still have a long way to go to hit our goal and make all that funding and the promised rewards a reality! We have to hit our goal of $9,000 by April 8th or none of the funding becomes official. So we're really hoping more and more people will spread the word and join our team! As far as other projects I've worked on, my big break was writing an issue of the Tales of the Teenage Mutant Ninja Turtles comic book series back in 2007. That was a huge dream come true as I'm a Ninja Turtles fanatic! Since then I've also written for the Kung Fu Panda and Megamind comic books, as well as Richie Rich and more titles. Robert: I'm pretty sure I'm famous because I started teaching with Comics Experience. Now that I'm getting stopped on the street for autographs and photos it's getting rather annoying. My completely obscure fame as a comic artist was much more comfortable. My career has mostly centered around G.I. Joe for IDW Publishing. I've done some work at Marvel Comics during breaks, including Amazing Spider-man, Ultimate Fantastic Four, and X-Men Forever. Quinn: People stop you in the street and get your autograph? Wow, how would that be? Seriously though, without fail I'm astounded with Robert's skill. There's nothing more rewarding then seeing an idea I've become so passionate about become an awesome cover or page! Well, maybe having that idea hit stores worldwide would be more rewarding. As far as my feelings about writing comics, it's hard work, but it's a labor of love for me. I love people and I'm fascinated with how people think, what makes each person individual and what drives them. I love taking characters with very different personalities, throwing them into a room together, and seeing how they play off each other. I think through character interaction like this, we can actually learn a lot about ourselves in the real world. Robert: He also likes writing because it takes so much less time than drawing. Heh. Quinn: I cannot overemphasize how completely true that is. Unlike Robert, I actually get to sleep more than 2 hours a night. I wish I were exaggerating! 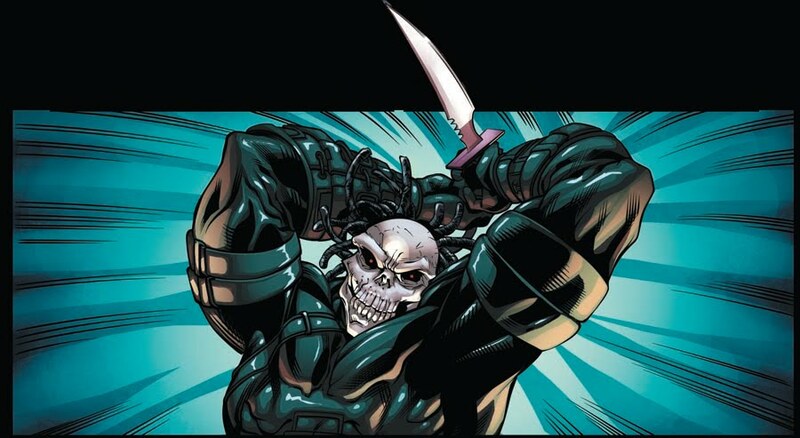 Robert: I really enjoy comics because of the ability to tell a story with my art. Even in my sketching I try to incorporate where a character has been or something they are about to do all built within the sketch. It makes the reader/viewer think and automatically engages them in the art. Luckily Quinn is an artist himself, and has a clear vision for this story. That helps me with the script because he describes a scene and I can see it immediately in my head. Quinn: HUGE sandwiches. When you've watched our Kickstarter video you'll know what I'm talking about! Robert: Hey I wasn't done. So you put that all on some sweet bread and a side of kettle chips... man, that's heaven on a plate. Quinn: Did I mention that I love working with Robert?